SOMMER is the brand of HAVER & BOECKER responsible for mixing systems and mixers, structural steel work, tank facilities and turnkey production systems. Along with providing mixing trials using scale-ups, the layout of complete mixing and agitator processes, and the manufacture and installation of machines and systems. For the intensive mixing and dispersion of low and high viscosity products. Available either with a moveable dissolver shaft or with a fixed dissolver drive. Conical vessel ensures that even extremely small feed batches are dispersed intensively. Minimum liquid is required during operation. For short mixing times, and also suitable for the mixing and dispersion of large volumes of low and high viscosity products, e.g. pastes and thixotropic products. Utilizes disk helixes for gentle mixing. 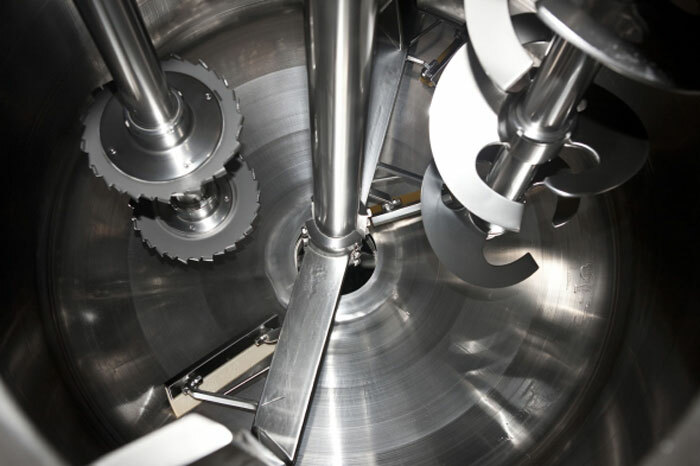 Right-hand rotation for drawing down solid materials and left-hand rotation for pulling up the mixture in order to aid the dispersion process and remove gases during vacuum mixing. For low energy consumption when dispersing low and medium viscosity products. As a result, the vessel shape and the arrangement of the mixer tools, a highly intensive dispersion with fine particle sizes is achieved.